Rather than whine on about other stuff (that may be coming in another post), I thought I'd post another bunch of animal CD covers - because I keep on falling over them, wherever I look! A couple of them were in new releases at Readings bookshop. Fantastic Brisbane three piece, The Grates are in their own category! 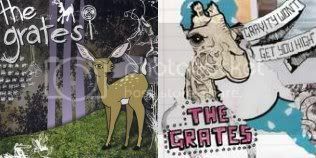 Their EP from last year, The Ouch And The Touch featured a catchy deer cover, but they proved their commitment to fine animal covers this month, with their debut album, Gravity Won't Get You High (featuring a Giraffe worthy of a Kevin Gilbert CD :)). While it's nice to see The Drones go from a boring green cover (the initial release of Wait Long) to the fully realized fishy cover above (on In-Fidelity), it's depressing to see that the Australian release of The Like's Are You Thinking What I'm Thinking? dispensed with its beautiful cover (previously posted here), instead opting for a boring photo of the band. However, the video for Josh Pyke's Private Education features wonderful animation in keeping with the cover of the EP (previously posted here). Please let me know any I've missed!